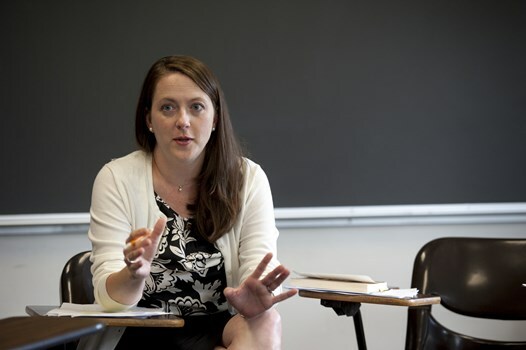 Dr. Robin Bates, associate professor of English, was one of four finalists for the American Shakespeare Center’s “Words in Action” award, which recognizes teachers who have inspired their students to appreciate Shakespeare. Students made more than 100 nominations for elementary school teachers, theatre practitioners, and university professors. The American Shakespeare Center, located in Staunton, Virginia, boasts the Blackfriar’s Playhouse, the world’s only re-creation of Shakespeare’s London indoor theatre. Dr. Bates takes students to see Shakespeare performed at Blackfriar’s Playhouse every year. Four students submitted enthusiastic nominations on behalf of Dr. Bates. “Because of Dr. Bates, I feel as if I know Shakespeare as a person and not as an elusive and serious writer,” Erin Gough ’15 wrote.